I decided I wanted to try some dual sport riding – some friends were riding modern bikes at events such as Dirty Dabbers, Michaex, Shenandoah, Hammerron, etc. This 310cc machine came through Al Snoop – it was fairly original but had been pushed outside and left for dead. Axles were rusted so bad that I finally gave up and cut the rear on both sides to remove the wheel! Engine was locked up also. It took me a couple years, but I completed the restoration and did some rides. The Mountaineer has problems with excessive heat build-up. I ran race gas, made some head modifications, carb setting, etc. It keeps getting better! It really rides well, I like the torque of the larger displacement. The seat is comfortable and the “laid-down” shocks provide some additional travel. I’m usually riding the oldest bike at the dual sports, but it’s neat that everyone notices! I just completed in the ARHMA 2-day qualifier/reunion in Mass. 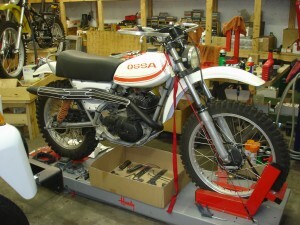 with about 10 other OSSA riders – we did well!